After two days in Ljubljana, we wanted to explore more from this beautiful country. We had time only to visit one more place and two options – another city and a famous lake that everybody spoke about to us. So our choice was made, our destination was Lake Bled. 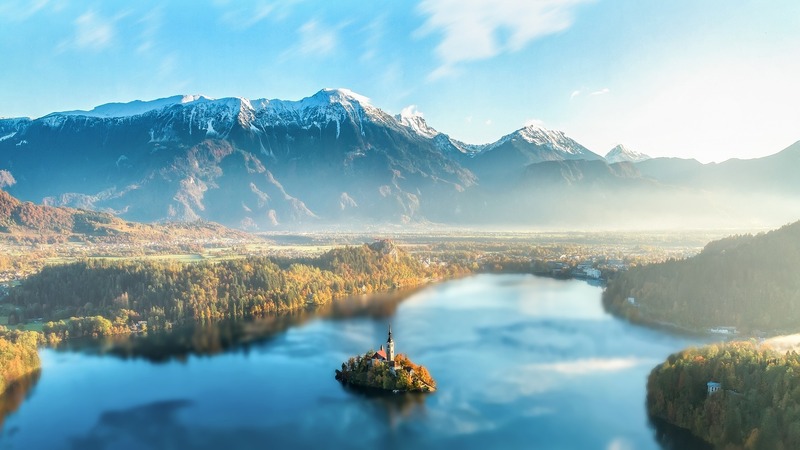 If you like a green landscape and a lake that looks a cut from a well-painted priceless picture, then Lake Bled is the place to be. The moment I arrived, I closed my eyes. I felt the warm breeze going through me, my heart started relaxing and my soul regenerating. 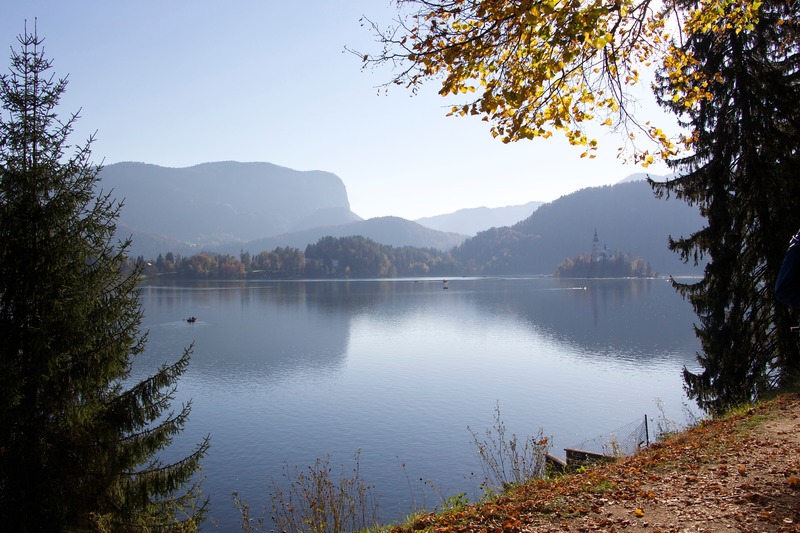 To truly experience Lake Bled in its fullest, I highly recommend renting a rowboat. Numerous shops around the lake rent rowboats. I and my wife rented one boat from a B&B shop for 20 euros per hour. Nothing to be scared of when driving the boat, because you don’t require prior experience. With the boat, we sailed to the Bled island. There is an old church located there, and it looks incredible. It is called Pilgrimage Church of the Assumption of Mary, and it originates from the 17th century. The architecture resembles any other Slovenian churches showing the dominance of the Austro-Hungarian rule. One thing puzzled us, as we were sailing to the island, the church bell kept ringing and ringing. It was not until we got there, we noticed every tourist was waiting their turn to ring the bell. We had no idea why, but we did it anyway for several times. It felt awesome and funny at the same time. However, we didn’t know that there was a legend behind the ring bells. It states, whoever rings the bell, all of their wishes will come into fruition. Five hundred years ago a woman lost her husband, and in his memory, she made the bell. When the time came to transport the bell to the church, there was a thunderstorm. It struck the ship and everyone on it. It was a sad moment, but when there is a will, there’s a way. The pope himself ordered the construction of a new bell, and that’s the bell that is today on the island. By ringing the bell, the user shows honor to the Virgin Mary, and their wish will come true. Well, it seems all our dreams will come true now because we rang it over ten times. Afterward, we returned to the shore and took a stroll around the lake. It took us around an hour and a half to go through all the coast. We enjoyed the west side of lake bled, because we were far away from all the cars and tourists we got the perfect view of Bled island. We felt relaxed, but hungry as well. 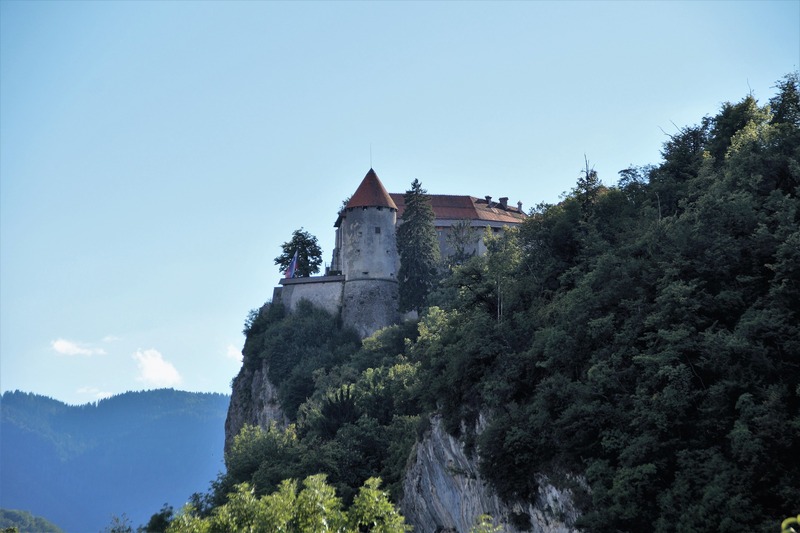 Nevertheless, we wanted to visit the castle Bled first. Castle Bled is of the oldest castles in Slovenia, past more than 1000 years. From there we experienced the most spectacular lake view. Also, we took a guided tour through the museum located inside the castle. We learned the 1000 history of the castle! We have highly recommended it. It was time to eat, and we sat down in the castle restaurant. I for one had already fallen in love with Slovenian kebabs. The way they cook, it is like no other Balkan country. We had lunch, and we were ready to move down. However, my wife doesn’t like meat, but she adores sweets. She ordered the Bled cream cake as we talked before one of the sweetest food ever in Slovenia. My wife ordered another one, and she couldn’t get enough! Lastly, we decided to visit Vintgar Gorge. And we didn’t regret it. Even though we were a bit tired, we did a 10-minute drive to see another fantastic part of Slovenia. We walked for 1.6 km on an elevated boardwalk. As we walked, we were astonished by the beauty of the Radovna River. 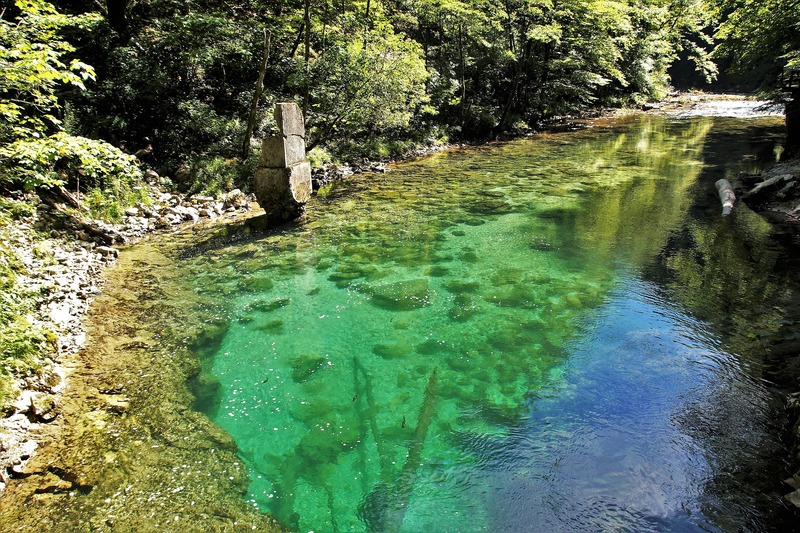 The river showed a wide specter of colors, making any eyes rest and enjoy the beauty of this world. We had the best time ever, and we stopped feeling tired. Finally, we returned to the hotel, and we were ready to pack for home. Slovenia is the place to visit if you want to explore nature, culture and a different European experience. If you have the chance, I highly recommend it; you will recharge your batteries and feel like a new person. Also, I plan another travel to Slovenia soon, so expect an original article in the near future! Depending on the time of the year of course. If its winter, then gets some warm and cozy clothes. On the other hand in spring or summer, feel free to take your short-sleeves shirts. Do you love kebabs? Well, they got some that are pretty tasty. Also, their cakes are amazing. In general, Slovenian cook right foot that’s not so expensive. However, if you go into a five-star restaurant, like anywhere in the world better take more money. There are hotels in Bled, but the main attractions and B&B. They are usually closer to the lake, even though they are expensive, they are worth the cost. As I said, it is only 20 euros per hour to rent a boat, and you won’t sail more than two. I highly recommend to do it with two or more people so the price won’t affect your budget. This is a town as well, and there are casinos if you like to gamble and good nightlife as well.